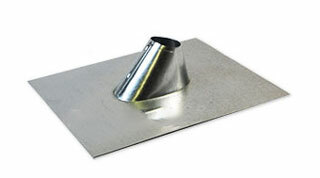 1-1/2 inch GALVANIZED ADJUSTABLE ROOF PIPE FLASHING (IP JACK). Riser Opening: 2 inch wide (fits 1-1/2 nominal sized pipes. Riser Height: 3-1/2 inch Base Size: 11 x 13 inch. 26 Gauge G-90 grade galvanized steel. Fits flat to 6/12 pitch roofs. Standard flashings are generally acceptable for use with steel and soil pipe, ABS, PVC, plastic or EMT (electric metal tubing). Available in aluminum. Other sizes available to fit pipes 1/2 to 6 inch pipes, and ventilation pipes up to 20 inch.